No, not that “living dead” movie. Or that other one. Or even the gajillionth knock-off that you just found in the “New Release” section of your video store last week. Directed by central Illinois native and Illinois State University alumnus Jason Huls under his Ten Wing Films banner, LAOTLD (as it will probably be known in horror film circles once the flick makes festival and convention appearances) was filmed primarily in Bloomington-Normal and Decatur with a five-person crew and more than 100 actors. After an ISU premiere earlier this spring, the zombie romp returns to B-N for an encore performance at the Castle Theatre, 209 E. Washington, Bloomington, IL, tomorrow night, Saturday, June 9, 7 p.m. Admission will be $3 with the doors opening at 6 p.m.
“The cast and crew will be in attendance to talk about the film and drink a lot of beer. You should probably do the same,” invites Huls on the movie’s official Weblog. No wiser words spoken, my friend, except for the fact that the Castle shut down in January. Didn’t it? Further research confirms that a comedy club has taken root inside the vintage movie house since Ben Slotky‘s departure (once again, see item: 1/5/07) and I can’t help but draw a parallel between the Castle’s unfortunate deevolution and LAOTLD‘s decomposing armies who once lived full, warm-blooded lives as human beings. 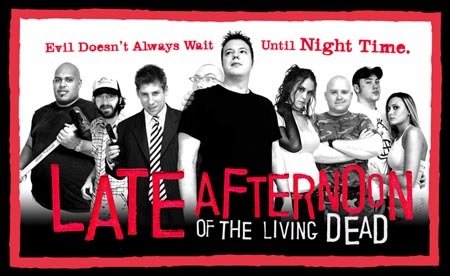 Naturally, it will take a “living dead” movie and its creators to reawaken the venue and remind everyone of its original purpose – if for one night only. This entry was posted on Friday, June 8th, 2007 at 10:27 pm	and is filed under Public Events. You can follow any responses to this entry through the RSS 2.0 feed. Both comments and pings are currently closed.